Material: Sterling Silver Plating Color: Gold, Silver, Rhodium, Etc. 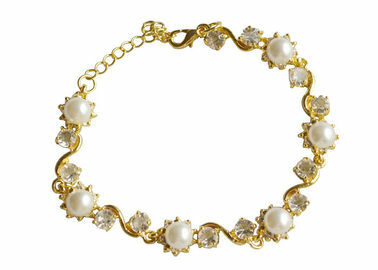 Sterling silver bracelet with white pearls flower chain and clear crystal bottom. This sterling silver bangle is made of 925 sterling silver. Plated color: gold, silver, rhodium, rose gold, etc. Main stone: crystals and pearls. This sterling silver bangle has excellent craftsmanship in high quality with reasonable price.